This paper intends to brief the reader about the solar energy and its use at a large scale. This would also discuss the process of generation of power gained through solar energy and some information about the different areas from the world where power is produced from. Let us first understand what solar energy is. Solar Energy: the Sun emitting energy from the core of its centre radiates this enormous amount of energy which is referred to as Solar energy. One hour of this energy emitted from the Sun is sufficient for the need of world’s population for a whole year. Direct energy is the energy received by earth that is emitted by the Sun, while Global energy is the energy diffused, scattered or reflected from clouds and energy re-radiated by the earth itself. Different countries differ in receiving this energy as it is specific to time which varies with latitude and seasons. But even with low fall of energy, it can still be used for conversion to generate electricity. The areas that receives enormous amount of solar energy can used for conversion, storage and transference. Thermal Systems: where Sun’s heat energy is collected through solar collector and use it to provide hot water or space heating. But this heat can also be used to generate electricity by heating the working fluid in heat engine which makes the generator run. Second is Photovoltaic System that captures Sun’s higher frequency radiation in an array of semi-conductor, photovoltaic cells that directly converts this radiant energy into electricity. The process of generation of electricity happens in two stages. Firstly, heat energy from Sun is captured which is used to heat a working fluid. This is used in second energy transformation to generate electricity. The temperature of working fluid is highly crucial and depends on rate at which heat energy has been absorbed and this helps in delivering the rate at which electricty can be produced. Another system is through use of mirrors. Thermal plant uses the system of mirror to concentrate the sunlight onto an absorber. This absorbed energy is used to power heat engine thereby driving the rotary generator. In large scale, these heat engine is the turbine driven by steam or other vaporous fluid state. For the process to operate smoothly, the working fluid releasing heat exchanger should not be allowed to cool down. Hence solar plants are supplemented by gas-fired boilers which generates some power output and maintain the temperature. 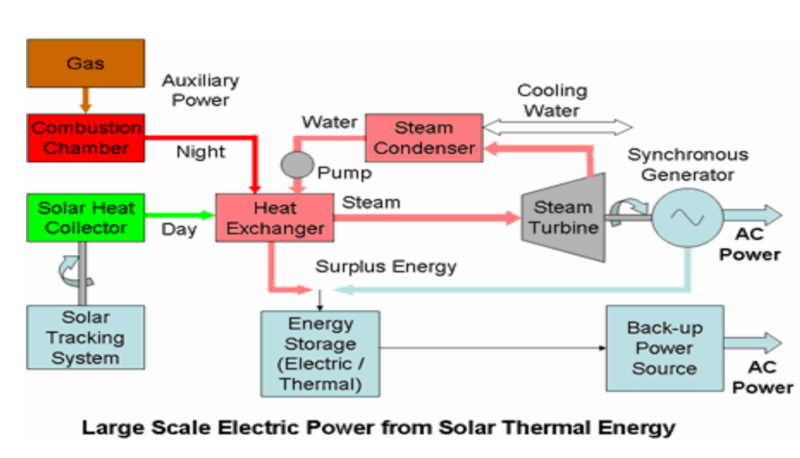 The diagram is a virtual representation of large scale electric power from Solar thermal energy. For the large scale generation of electricity, it is required to have a large piece of land with carefully designed and engineered parts. This is one reason for the cost is high to produce electricity compared to other methods. Hence few of the countries build smaller and more efficient solar power plants in order to meet the demands of electricity at the local community level. This is also generated with conjunction with other energy sources or local energy storage place. The major large scale power plants are installed in Spain, Czech Republic, France, Germany, Italy and Korea. The major countries in the world accept and acknowledge the need to decarbonize the energy supply and avoid the risk of dangerous climate. The advantages of renewable and reliable sources of energy like that of Sun is growing pace around the world, however until the large scale solar conversion is a cheaper alternative. Many investment through research and policy making in different country is into consideration for adaptating Solar energy into the main source of energy.